Thanks for this. I know plenty of beeks who don’t treat at all for Varoa and others who treat but don’t monitor the drop count, but they all seem to be able to go on from one year to the next somehow. Are you suggesting that treating for Varroa isn’t therefore necessary? Presumably they’re not in one of the few remaining mite-free areas and their ability to ‘go on from one year to the next’ isn’t through constant loss and replacement? 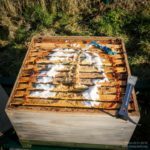 It’s clear that feral/wild honey bees can tolerate Varroa by maintaining small, swarmy colonies – I’ve posted about this previously. Based on these observations, some people have proposed replicating this as a practical way of beekeeping. I’m not convinced … small colonies are unlikely to collect much excess honey, if any, and the individual bees in the colony will be subjected to much higher pathogen levels. I accept that some beekeepers don’t keep bees for honey production, which is fine. 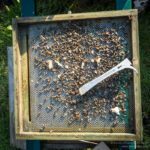 However, do they not have a responsibility to keep them as healthy as possible – both for the sake of their own colonies, and for other local beekeepers? 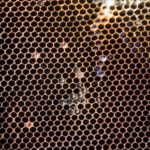 Finally, there’s increasing evidence that honey bee pathogens are also found in other pollinating insects. Disease-ridden honey bee colonies therefore pose a risk to both neighbouring honey bee colonies and other pollinators. I wasn’t suggesting anything. 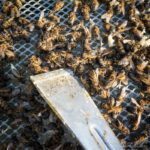 My comment was more on a practical level – why colonies die when they’re being treated and monitored for Varroa, whilst others go on from year to year with minimal intervention. I know of one beekeeper who believes he has reduced his duties to no more than 5 hours per year (I think he has three colonies). This year he produced Ross Rounds. It was a “why” comment, not an argument one way or the other. For this particular colony I think I know why … it was being treated without being properly monitored. 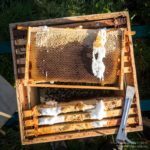 The ‘minimal intervention’ may just be outstanding beekeeping – for example, colony splits at just the right time to give a long broodless period and suppress mite replication etc. might help (and I think Randy Oliver is a strong believer in using splits as part of his IPM strategy). I don’t think that’s impossible, but I’m certainly not a good enough beekeeper and I’m not convinced it’s the best way to maintain strong, healthy colonies for honey production. Five hours per year … certainly possible I’m sure (and I’ve seen the justification) but why would you want to reduce time spent doing an enjoyable hobby? Ross Rounds are however an attractive proposition. Apparently not at all easy to produce in significant numbers, which you’d need to do because of the initial outlay required to buy the special super frames. I’m not sure the nectar flow(s) are either strong enough or dependable enough here to use them properly. I’ve been meaning to have a go for a few years but baulk at the £130 per super from Thorne’s. Thanks for sharing your thoughts on the colony’s demise. So often varroa seems to be involved. 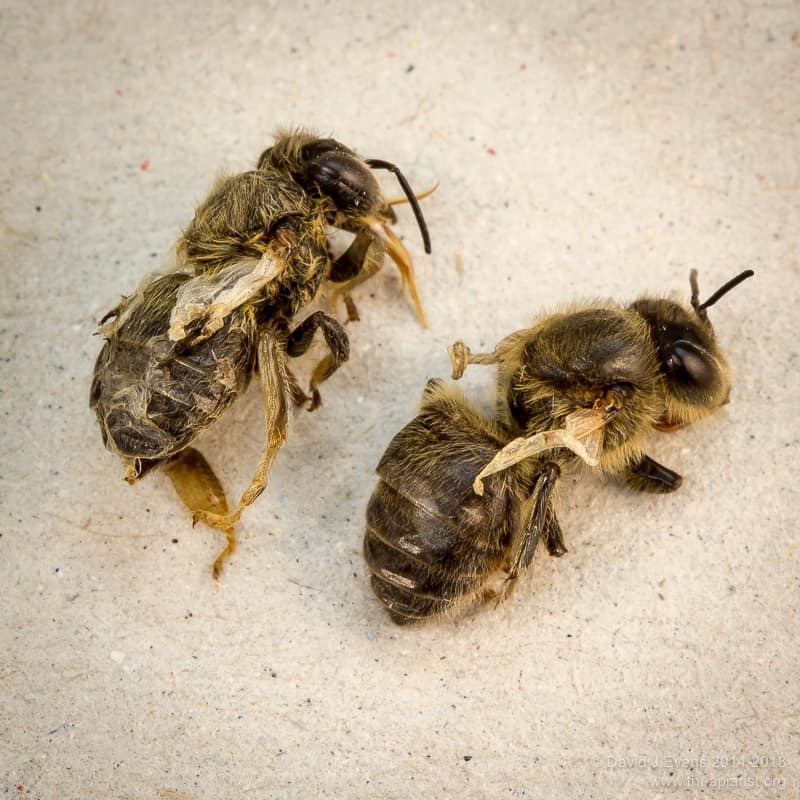 For overwintering losses, if there’s no clear evidence of anything else – starvation, Nosema, flooding, woodpeckers, vandalism – I’d be reasonably certain it’s the viruses that were transmitted by Varroa that did ’em in. And if there’s any doubt about the timing or efficacy of the late summer/early autumn mite treatments then I’d be surprised if it wasn’t Varroa and the viral payload. Thank you for this post. It has made me think more about my colonies where the mite load had been persistently high despite vapourising several times, and where now the count is negligible. . Maybe there are very few bees rather than few mites. It is also a reminder that in winter, seeing some activity at the entrance on milder days can seem reassuring, but does not necessarily mean that all is well within, or that the colony is viable. Your post is also a clear example of the longer term often unforeseen consequences of actions we might take with a colony – often with a time delay of many months. Sobering reflections but it is really helpful to have this perspective. I’m pleased you found it useful. There’s little you can do about your colonies at this time of year other than to ensure they have enough stores. As you say, their fate is at least partly determined by things that happened last September. It’s also worth noting that different colonies (equally strong) show markedly different levels of activity on ‘borderline’ winter days – I have several where I know there’s good numbers of bees and that brood is being reared, but that look nearly moribund when compared with the colony on the same stand. I know there’s a lot of hype about vaporising being the solution to solve all mite problems, but I don’t think there’s any properly quantified study of how effective it is when used repeatedly on colonies when brood is present. Although I’ve used it like this for some time, I’m not convinced it’s as good as some claim. In my opinion your analysis is correct. 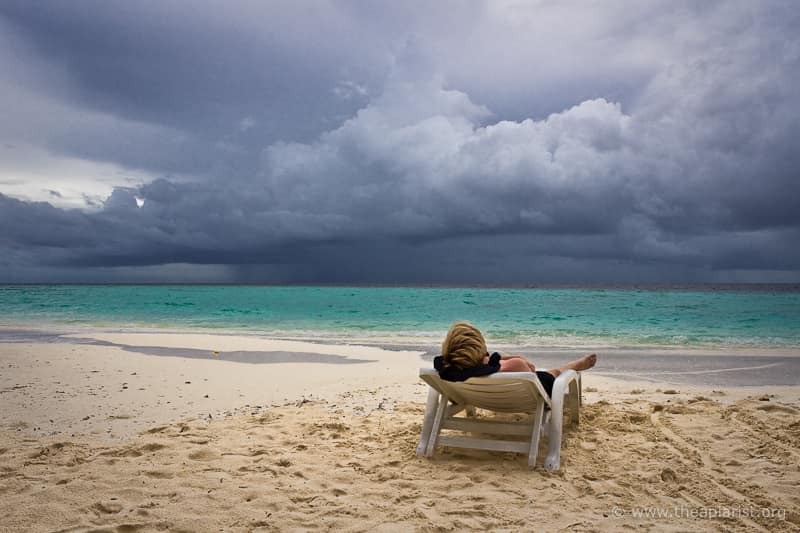 It largely mirrors most of my losses in the middle of winter. In a simple way I would put things like this: the high infestation by varroa kills the hives in the beginning / middle of autumn; Average infestations during summer and autumn kill the colonies in the middle of winter (sick bees die before spring turnover); Hunger kills the colonies in late winter / early spring. This simple formula reflects most of the causes of the fall / winter mortality of my hives in Portugal. At this moment I am very convinced of this simple and challenging reality. All the best for you and your bees! And you can overlay what you describe with queen problems which appear overwinter and mid-season issues with chronic bee paralysis virus, the incidence of which appears to be increasing. This beekeeping business isn’t straightforward! Thanks for the post, very informative, This season when I put bait boxs out il leave them in an out Apiary all season to monitor, just to be sure. 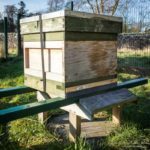 You can site the bait hive where you think you’ve got the best chance of catching a swarm, but then move them to a quarantine apiary as soon as a swarm arrives. It’s worth remembering that you can re-home a swarm within 24-48 hours of it arriving without worry that they’ll all return to the site of the bait hive.